Americans for Legal Reform Meeting May 4, 2010 ! Wesley Martin will speak on "Mortgage Fraud." Richard Copper ewill speak on "Pork Lawsuits." Lawyers invited and bring your friends. What’s More Compromising Than Money? The Supreme Court abdicated its responsibility to address fundamental questions of ethics and fairness when it declined to review the case of Charles Dean Hood, an inmate on death row in Texas. The one-line order, issued without comment from any of the justices, left in place an egregiously tainted 1990 double-murder conviction. Eighteen years after Mr. Hood was sentenced to death, the state trial judge, Verla Sue Holland, and Tom O’Connell, then the Collin County district attorney, admitted that they had had a secret affair that appears to have ended not long before the trial. After considering these seamy circumstances, the Texas Court of Criminal Appeals last year denied Mr. Hood’s request for a new trial, ruling — incredibly — that he took too long to raise the conflict of interest and should be executed. Yet it took a court-issued subpoena to get the two officials to confirm their long-rumored affair. Their success in hiding their relationship should not count against Mr. Hood. In a separate appeal, Mr. Hood was granted a new punishment trial on grounds that jurors were not allowed to properly consider mitigating evidence that might have persuaded them that he didn’t deserve a death sentence. The ruling made no mention of their entanglement. That trial is pending. Judge Holland’s failure to recuse herself violates the most basic, and obvious, principles of judicial ethics and due process. The Supreme Court should have grabbed the case to say so and order a new trial for Mr. Hood. That was the course urged by 21 former judges and prosecutors and 30 experts on legal ethics who supported Mr. Hood’s petition to the Supreme Court. The Supreme Court correctly ruled last year that millions of dollars in campaign spending on behalf of a judge’s election bid created an intolerable “probability of actual bias.” The court decided that Chief Justice Brent Benjamin, of the West Virginia Supreme Court of Appeals, was required to recuse himself from a case involving Massey Energy, one of the country’s biggest coal companies, after Massey’s chief executive spent $3 million to help get Justice Benjamin elected. The right to a fair hearing, before an impartial judge, is at the heart of the nation’s judicial system. If money raises a serious question about that impartiality, love seems to be at least as worrisome. The Supreme Court, sadly, failed in its duty to clearly draw that line. A former enforcement attorney for the Securities and Exchange Commission was sentenced Friday to eight years in prison for his role in a series of multimillion dollar pump-and-dump stock fraud schemes. Dallas-based attorney Phillip Offill Jr., 51, was convicted by a jury earlier this year on 10 counts of wire fraud and conspiracy. He testified that he was acting within the law, but the jury rejected his defense, and so too did U.S. District Judge Liam O'Grady. "Your testimony ... was an affront to justice," O'Grady told Offill at Friday's sentencing hearing. "It was one of the biggest packs of lies I've ever heard." Offill, who worked at the SEC for 15 years before taking a job at the Godwin Gruber law firm in Dallas, aided schemes that by conservative estimates cheated more than 1,500 investors out of at least $2.4 million. The fraudsters would pump up the value of dubious penny stocks and then sell the shares at inflated prices to unwitting buyers. Eight other coconspirators have already been convicted and sentenced in a case that has been under investigation for more than three years. Most of the illegal transactions took place in 2004. The eight-year term imposed on Offill was one of the most severe. Prosecutor Ed Power said the tougher sentence was deserved because Offill lied on the witness stand and because his status as a respected attorney helped provide cover for the fraud. "If anyone knew that these actions were wrong, this defendant did," Power and prosecutor Patrick Stokes wrote in a sentencing memo. Prosecutors had wanted the judge to impose a sentence within federal guidelines, which called for 14 to 17 years. The defense asked for no more than three years. O'Grady said he would have imposed an even higher sentence except for the fact that many in the conspiracy received significantly lighter sentences after striking plea bargains. One leading participant, Las Vegas blackjack dealer-turned-securities lawyer David Stocker, was sentenced last month to less than three years in prison. Nobody received more than 10 years in prison and several were sentenced to only a few months. Some of the conspirators earned as much as $9.5 million in the scheme -- Stocker's profit was significantly less than that. Offill declined to speak at Friday's hearing. His attorney, federal public defender Kevin Brehm, said Offill will appeal the conviction. Offill was also ordered to pay about $30,000 in restitution to victims. In court Friday, prosecutors said that most of the identifiable victims of the scheme have already received restitution from other defendants, totaling several million dollars. It is highly unusual for victims of a fraud of this magnitude to receive full restitution, but in court papers prosecutors estimated that they were able to locate and verify only about 3,000 of the 24,000 investors who were ripped off by the various schemes. PHILADELPHIA, PA - An ugly dispute between two women lawyers in the Philadelphia city solicitor's office is now being aired in a federal lawsuit in which one, the plaintiff, claims that her husband was having an affair with the other woman, who was her supervisor, and that the conflict ultimately resulted in the plaintiff's firing. Now a federal judge has tossed out some of the woman's claims, but ruled that she must be allowed to proceed on others, including a claim that her firing was in retaliation for her having sued the other woman for defamation, and a claim that the firing was racially motivated. In the suit, Darlene Davis-Heep claims that her ex-husband, Jeremy Heep, a partner at Pepper Hamilton, became romantically involved with Kathleen Tia Burke. Davis-Heep's suit, filed by attorney Brian Puricelli, alleges that City Solicitor Shelley R. Smith hired Burke in March 2008 and placed Burke in a supervisory position over Davis-Heep. At the time, the suit alleges, Smith knew that Davis-Heep was married to Jeremy Heep and that Burke "was having a physically romantic affair" with Heep. Davis-Heep claims that she was later forced to file a defamation suit against Burke because Burke began making false statements in the office, including the allegedly false statement that Burke had secured a protection-from-abuse order against Davis-Heep. The defamation suit settled, Davis-Heep claims, with a promise by Burke to "concede in writing and to Shelley Smith" that she, Burke, had "lied about Davis-Heep." But the dispute didn't end there, the suit alleges, because Puricelli demanded access to the documents in the defamation suit settlement. At the time, Puricelli had recently secured a $10 million verdict in a civil rights suit against the city, and Burke was handling the city's post-verdict negotiations. 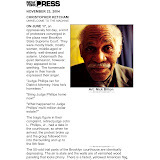 The $10 million verdict in McKenna v. City of Philadelphia, a race discrimination suit brought by three white police officers, was later severely slashed when a federal judge ruled that each of the three plaintiff's compensatory awards must be capped at $300,000. 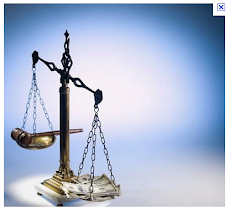 With backpay awards added, the total judgment now stands at about $1.1 million and the case is currently on appeal. Davis-Heep claims in the suit that Smith denied to Puricelli that she had any knowledge of the settlement, and that Smith soon after fired Davis-Heep on the grounds that she must have been Puricelli's source for discovering the existence of the defamation suit settlement. The suit alleges that the firing violated Davis-Heep's First Amendment right to petition since the firing was in retaliation for her exercising her right to sue Burke, and that race was also a factor. Davis-Heep is black and both Jeremy Heep and Burke are white. 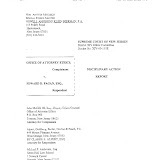 Lawyers for the city moved to have the entire suit dismissed, arguing that Smith's decision to fire Davis-Heep was clearly justified by Davis-Heep's failure to keep her personal disputes with Burke from interfering with the work in the office, and because Smith had concluded that Davis-Heep had improperly supplied information to Puricelli in a suit against the city. 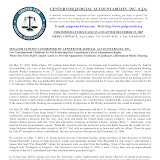 "In light of plaintiff's disregard for Smith's direction to not allow her personal issues with Burke to spill over into the workplace and in light of plaintiffs decision to act in her own personal interest and in reckless disregard for the interests of the city law department, plaintiff was terminated on December 4, 2008," attorneys Danielle Banks and Michelle K. Carson of Stradley Ronon Stevens & Young wrote in the city's motion to dismiss. Now U.S. District Judge Robert F. Kelly has sided with the city, granting dismissal of several of Davis-Heep's claims, but ruled that two of the claims must be allowed to proceed. Kelly found a fatal flaw in one of Davis-Heep's First Amendment claims that focused on her complaints to Smith about Burke. "Here, plaintiff's report to the city supervisors consisted of statements allegedly made by Burke regarding plaintiff, in the context of a 'physically romantic affair' between Burke and Jeremy Heep," Kelly noted in a 24-page opinion in Davis-Heep v. City of Philadelphia. "It is apparent that such complaints consist of purely personal matters and cannot be deemed a matter of public concern. Accordingly, this claim is dismissed," Kelly wrote. But Kelly refused to dismiss Davis-Heep's other First Amendment claim in which she says her firing stemmed from retaliation for her lawsuit against Burke. "It is well established that a public employee is protected under the First Amendment's Petition Clause against retaliation for having filed non-sham lawsuits, grievances, or other petitions with the courts or other government bodies," Kelly wrote. Defense lawyers argued that Davis-Heep cannot show a "causal relationship" between her alleged protected activity and the alleged retaliatory action. But Kelly found that, at such an early stage of the litigation, Davis-Heep must be allowed the opportunity to establish the connection through discovery. Although the city has not yet filed a formal answer to the suit, there were strong hints in court papers that many of the facts will be disputed. Attached to the city's motion to dismiss was the letter that Smith gave Davis-Heep on the day she was fired. 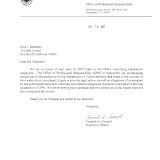 In the letter, Smith noted that she had met with Davis-Heep in March 2008 to discuss Burke's hiring and noting that she warned Davis-Heep not to allow any unresolved problems with Burke to "spill over into the workplace." The letter went on to say that Davis-Heep "showed poor judgment" when she ignored that warning and delivered documents to Burke through Burke's secretary. Smith's letter also faulted Davis-Heep for providing information about Burke to Puricelli. In explaining her decision to fire Davis-Heep, Smith wrote that the "totality of these circumstances leads me to conclude that you have disregarded my direction to not allow your personal issues with [Burke] to spill over into the workplace and have, instead, chosen to act not only in your own personal interest but in reckless disregard of the interests of this department." Banks declined to be interviewed, saying the city has a strict policy of not commenting on pending litigation. Jeremy Heep also declined to be interviewed. New York City's public campaign financing system has proven to be a model for the nation in regulating how money - in the form of campaign contributions to candidates - can distort the selection process of our elected officials. Unfortunately, the judiciary - where the nexus of money, politics and official performance is most corrosive to public confidence in the administration of justice - does not fall under its mandate. The Fund for Modern Courts is today issuing a report containing a proposal we believe would strengthen public confidence absent a broader reform of the judicial selection process. Modern Courts has long supported merit selection of judges at all levels of our multilayered judicial system. But currently, most judges in the Supreme and Civil Courts, among others, are chosen in elections where few voters know the candidates, and ethical obligations constrain the candidates from presenting more than their resumes and endorsements. And virtually the only contributors to judicial candidates, other than the candidates' personal assets, are lawyers, many of whom will then appear before those judges. That is not a recipe for justice and fairness. Many judges run first in party primaries, prior to a general election against another party's candidate. State Supreme Court justices are nominated in party-controlled judicial conventions where partisan concerns trump quality concerns. Sometimes the same candidate is cross-endorsed on two or more party lines, making elections mere formalities. Moving to merit selection would require a lengthy process of state constitutional change, led by partisan officials who benefit from the current system. We cannot wait that long. 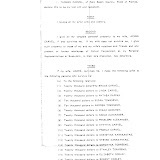 Modern Courts wants the Administrative Board of the Courts to adopt a per se rule requiring judges to recuse themselves from cases in which any party - the defendant, plaintiff, any holder of more than 5% of the stock in one of the parties, any insurance company with an interest in the outcome, or the attorneys - has made contributions to the judge's campaign totaling $1,000 or more. This rule would avoid the kind of egregious behavior cited by the U.S. Supreme Court last year in Caperton vs. A.T. Massey Coal Co., which found that a judge on West Virginia's highest court should have recused himself in a case in which Massey's CEO independently spent $3 million to oppose a judge's reelection just as the company's appeal of a $50 million jury verdict was about to go before that court. New York's highest court, the Court of Appeals, is beyond that pressure since we ended direct election to that bench in 1978 and shifted to a merit appointive system. But principal entry-level judicial positions require contested elections in which candidates must raise and spend money to achieve office. This issue has gained urgency after the recent U.S. Supreme Court decision in Citizens United vs. the Federal Election Commission, which held that the First Amendment prevents the government from limiting independent corporate and union expenditures in political campaigns, including judicial campaigns. As Associate Justice John Paul Stevens (pictured above) noted in his dissent, states cannot limit corporate contributions "even if they believe such limits to be critical to maintaining the integrity of their judicial systems." Modern Courts believes that requiring judges to recuse themselves when parties before them have made significant campaign contributions will avoid abuses and strengthen public confidence in the administration of justice. 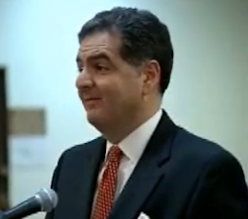 Kovner is the chair of the Fund for Modern Courts. WASHINGTON, D.C. — Senator Charles E. Schumer of New York has long been known as one of Wall Street’s best friends on Capitol Hill, but there are apparently limits to that friendship. After years of being a go-to guy for the elite of high finance, Mr. Schumer has embraced new legislation that would put constraints on his hometown’s leading industry. The stance has put him at odds with Mayor Michael R. Bloomberg, caused consternation among his allies at the investment houses and led to suggestions that he was putting political ambition ahead of protecting New York’s interests. “There are some on Wall Street who want me to say Wall Street right or wrong, and I’m not going to do it,” Mr. Schumer said in interview on Thursday, a few hours after Democrats brought their overhaul of financial rules to the floor. “Clearly they did a lot of things wrong,” he said. “Too many Wall Street firms had no one looking over their shoulder, and they went off the deep end.” Mr. Schumer acknowledges that his evolution on the issue has not been without some anguish as he navigates gingerly between the financial patrons he has mined for millions in campaign donations for himself and his party, and constituents who were hurt by the economic collapse. Normally among the most visible and audible of Democrats, Mr. Schumer has taken an uncharacteristically low profile on the touchy subject, a strategy that somewhat boomeranged when it drew some tabloid heat in New York, as well as a criticism from Mr. Bloomberg. An outspoken defender of the financial industry, Mr. Bloomberg has opposed imposing new costs on or limiting the size of banks, in part out of concern that undercutting Wall Street’s profitability could eat into the city’s tax revenues. The mayor expected Mr. Schumer to join him in backing Wall Street, and when he did not, Mr. Bloomberg used private meetings, including one on April 12 with Senator Mitch McConnell of Kentucky, the Republican leader, to express frustration with Mr. Schumer’s position. Mr. Schumer said he was caught off guard by reports of the friction since the mayor had not mentioned it to him, sparking an air-clearing phone conversation between the men on Wednesday. “He said, ‘I don’t want to get in a fight with this’ and I said neither do I, but you have to tell me — I may agree, I may disagree — which parts of this bill are good in your opinion, and which are detrimental to New York,” Mr. Schumer recounted. He said their respective staffs are now trying to identify the trouble spots. The mayor’s rebuke also stirred some resentment among other members of the New York Congressional delegation, who at a private meeting Thursday made their views known to a representative of the mayor’s office. Aides insist that Mr. Schumer and Mr. Bloomberg remain friendly and they expect no lasting repercussions from the dust-up. Mr. Schumer’s wife, Iris, served as a commissioner in the Bloomberg administration until 2007, and the couple is known to dine with Mr. Bloomberg and his companion, Diana L. Taylor. But with the legislation now heading toward a showdown in the Senate, Wall Street has been left to defend itself with little public help from Mr. Schumer, who has long been among the top recipients of campaign donations from the financial services industry. Beyond his concerns with the substance of the issue, Mr. Schumer also has to balance pressure from a crucial constituency at home against national political trends. With Senator Harry Reid of Nevada, the majority leader, facing a tough re-election fight this year, Mr. Schumer is often mentioned by Democrats as a possible successor as party leader. In the current climate being seen as too close to Wall Street would not be an advantage. Mr. Schumer said any suggestion that a leadership contest was a driving factor in his thinking is “bunk,” saying he does not expect one since he anticipates Mr. Reid will win. “This is about doing the right thing for the country and doing the right thing for New York. Period,” he said. Mr. Schumer said he had used his influence as the third-ranking Democrat in the Senate and his senior membership on the Banking Committee to help draw up balanced legislation that seeks to correct flaws in the regulation of the financial industry while avoiding a legislative response that was punitive or vindictive. Colleagues give him credit for applying his expertise on what is a complicated subject. “He understands that world very well,” said Senator Christopher Dodd, Democrat of Connecticut and chairman of the Banking Committee. “He understands the importance of getting a structure in place that works. He knows these people, he knows these institutions and he understands the importance of reform.” “The last thing we want to do is put these people out of business,” Mr. Dodd said. Michael Barbaro contributed reporting from New York. A Long Island lawyer has been charged with participating in a mortgage fraud scheme where seven conspirators used straw buyers and falsified documents to secure mortgages totalling $2 million. The Brooklyn District Attorney's Office yesterday charged seven people, including Melville solo-practitioner Ralph Pecorale, with conspiring to fraudulently buy and sell the same vacant Bedford-Stuyvesant home as many as five times, using false employment and financial documents and, on one occasion, a stolen identity. According to the indictment, Mr. Pecorale represented the banks in each of the transactions, purposefully misleading them into granting the loans. The defendants have each been charged with grand larceny and conspiracy and face up to 15 years in prison, according to the district attorney. Mr. Pecorale graduated from Touro Law Center in 1998 and specializes in real estate. He is also an accomplished poker player, having placing second in the U.S. Poker Championship in 2005. Paul J. Fishman, the United States attorney for New Jersey, said Mr. Cammarano had “sold his influence,” and in that regard was no different from countless other corrupt officials before him. “I’m disappointed that this issue doesn’t go away,” Mr. Fishman said in an interview. “I would hope that all public officials would understand that their job involves a public trust, and that they shouldn’t attempt to feather their own nests at the expense of the constituents they are sworn to serve. Unfortunately, there are some number of folks who haven’t gotten that message.” The common thread in last year’s corruption sweep was Solomon Dwek, a one-time real estate developer who was, himself, caught in illegal financial dealings, and became a cooperating witness. He offered bundles of cash in return for support for fictitious projects, and apparently had no trouble finding takers. Some took illicit campaign contributions, others pocketed the money, prosecutors say. The case snared defendants from New Jersey and New York, including several rabbis accused of running a money-laundering ring and a man accused of trying to arrange the illegal sale of a human kidney. ALBANY, NY — Attorney General Andrew M. Cuomo filed a civil lawsuit against the Senate majority leader, Pedro Espada Jr., on Tuesday, accusing Mr. Espada, his family and his political aides of siphoning more than $14 million from a network of nonprofit health care clinics he founded — money used for meals, vacations and campaign expenses. Mr. Espada used the network as a “personal piggy bank,” the suit said, to pay for expenses over the last five years like $20,000 worth of takeout sushi and $50,000 to maintain a Bronx apartment where opponents have asserted that he does not live. He was also given a severance package now worth $9 million that would leave the clinics bankrupt if paid out, the suit said. Mr. Espada, a Bronx Democrat, was able to drain money from the organization, the Comprehensive Community Development Corporation, by stacking its board with relatives and Senate employees, the suit said. “I have not seen anything on this scale,” Mr. Cuomo told reporters in a conference call on Tuesday. He said that the civil suit was probably only his first move against Mr. Espada, who was elevated to majority leader by Senate Democrats last summer after agreeing to end a monthlong coup that had paralyzed state government. “I think criminal charges are a very real possibility,” Mr. Cuomo said. 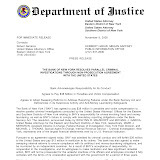 “Stay tuned.” The suit, part of a continuing investigation by Mr. Cuomo into Mr. Espada’s political and business activities, seeks to remove Mr. Espada as president of the nonprofit corporation, which runs four health clinics in the Bronx that receive most of their financing from the federal and state governments. The lawsuit, which names 19 current and former directors of the corporation in addition to Mr. Espada, also seeks to remove its entire board. Mr. Cuomo said it had rubber-stamped millions of dollars’ worth of inappropriate contracts and expenditures. Those expenditures, the suit said, also included the use of a Mercedes-Benz by Mr. Espada; vacations for the senator and his family to Las Vegas, Miami and Puerto Rico; and at least $100,000 worth of campaign literature paid for with money funneled through the clinics, known as the Soundview HealthCare Network. The board also appears to have approved for Mr. Espada a $9 million severance package, which far exceeds Soundview’s net assets, leaving the network technically insolvent. The Soundview network brings in millions of dollars a year in federal and state aid to deliver health care to poor patients, much of it through Medicaid and Medicare reimbursements. But the investigation found that what Mr. Cuomo described as Mr. Espada’s “looting” of Soundview had left the clinics in a precarious financial condition. As an outside accounting firm tried to clean up Soundview’s books in 2007, the complaint said, a Soundview official directed the accountants to ensure that Mr. Espada and his family were paid before any other financial obligations were met, including Soundview’s rent and utilities. Even as Soundview handed out millions of dollars to Mr. Espada and his associates, the suit said, the clinics failed to pay hundreds of thousands of dollars in payroll taxes, an omission that led state officials to cancel a $3 million contract last year that would have allowed Soundview to build a new clinic. Soundview also continued to employ three women who were convicted in 2005 of diverting public money to Mr. Espada’s campaign. As a result, state health officials denied Soundview’s application last year to resume financing from the federal Women, Infants and Children program, which provides food and nutritional counseling to new mothers and young children. Some patients visiting Soundview’s White Plains Road clinic on Tuesday said they were outraged about the allegations. Danette Williams, 26, a home health aide who lives in the Bronx, said that the clinic had been a vital part of her life, providing prenatal care to her. “I would hate to think he’s a person who claims to be about the community,” Ms. Williams said, “but it turns out he really isn’t.” Nate Schweber contributed reporting. Breakaway Democratic Senator Pedro Espada on the floor of the Senate chamber during a short Republican session, in the Capitol in Albany, NY on Monday June 29, 2009. New York's five mob families - the Luchese, Gambino, Bonanno, Genovese and Colombo clans - will have to make some room. Say hello to the Espada organization out of the Bronx. In an astonishing civil suit unveiled Tuesday, state Attorney General Andrew Cuomo charged that Senate Majority Leader Pedro Espada Jr. and 19 relatives or officials of his Soundview HealthCare Network have looted more than $14 million from the government-funded nonprofit since 2005. If proved, the actions of Espada and his associates would mark a new low for brazenness and greed in a city that has seen its share of notorious poverty pimp operations. No official at the White Plains Road headquarters of Soundview would talk with the press Tuesday. Espada started the center 32 years ago, turned it into this political and financial base, and is still president and CEO. As Justice John Paul Stevens is so ably about to prove, "90" may be the new "70," at least for judges, and state lawmakers are taking note. Stevens announced last week that he would retire when the current Supreme Court term ends. He will turn 90 on April 20. If Stevens were a state Supreme Court justice, he would not have had the option of choosing when to retire because most states require those judges to step down after age 70, according to the National Center for State Courts in a recent study. But nine states this year have legislation pending that would either eliminate or raise the retirement age. The Center noted that 20 states require retirement at age 70; four at 72; two at 74, and six at 75. Vermont is the only state with a mandatory retirement age of 90 for a state Supreme Court justice. If applied to the U.S. Supreme Court, those states' retirement rules would force from the bench not only Justice Stevens, but also Justices Antonin Scalia, Anthony Kennedy, Ruth Bader Ginsburg and Stephen Breyer. In 2009, the Center reported, Kansas increased the age at which their justices must retire from 70 to 75, and South Dakota's House of Representatives also approved an increase from 70 to 75. The nine states that have recently considered or are considering legislation to increase or eliminate mandatory retirement ages for state judges are: Alabama (from 70 to 72); Arizona (70 to 75); Massachusetts (70 to 76); New Hampshire (70 to none); New Jersey (70 to 75); New York (70 to none); Virginia (70 to 73); Washington (75 to none) and Wyoming (70 to none). Justice Stevens' career, of course, is not the trigger for the action in the state legislatures. William Raftery, a court research analyst at the Center first noted what could be an emerging trend back in February. Raftery suggested that the states have begun to reexamine mandatory retirement rules as the Baby Boom generation ages, life expectancies increase, and more veteran and able judges are forced into retirement. In the Matter of the Proceeding Pursuant to Section 44, subdivision 4, of the Judiciary Law in Relation to CARLOS M. CALDERON III, a Justice of the Milton Town Court, Saratoga County. The respondent, Carlos M. Calderon III, a Justice of the Milton Town Court. 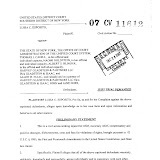 Saratoga County, was served with a Formal Written Complaint dated October 8, 2008, containing one charge. The charge alleged that respondent referred to his status as a judge in communications with prison officials asking them to confiscate documents from an inmate in furtherance of respondent’s personal interests. Respondent filed a verified Answer dated November 7, 2008. 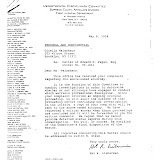 By Order dated January 15, 2009, the Commission designated Michael Whiteman, Esq.. as referee to hear and report proposed findings of fact and conclusions of law. 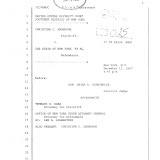 A hearing was held on April 10 and May 11, 2009, in Albany. The referee filed a report dated October 16, 2009. The parties submitted briefs with respect to the referee’s report and the issue of sanctions. Commission counsel recommended that the judge be censured, and the judge’s attorney recommended that the judge be admonished. Oral argument was waived. Thereafter, the Commission considered the record of the proceeding and made the following findings of fact. 1. 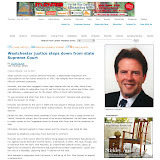 Respondent has been a justice of the Milton Town Court, Saratoga County, since January 2006. He is not an attorney. Prior to assuming the bench. respondent was a New York State Trooper. 2. On February 24, 2005, as a State Trooper, respondent was involved in a high-speed pursuit of Octavio Rivera, who had stolen a motor vehicle. The chase ended with a collision between respondent’s police cruiser and the stolen car. 3. Mr. Rivera was charged with numerous crimes including Robbery, Driving While Intoxicated and Assault. At the trial, respondent testified against Mr. Rivera and was cross-examined by Mr. Rivera, who acted as his own attorney. 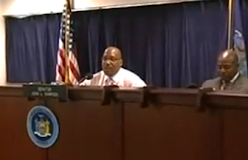 Mr. Rivera was convicted, sentenced to 15 years imprisonment and remanded to Sing Sing Correctional Facility. 5. On November 30, 2005, respondent completed the Victim Impact Statement. Respondent described the accident and his physical injuries, indicated that he had not suffered any emotional injury and said that he had “forgiven and [was] moving on.” Respondent gave his home address on the form. 6. Respondent retired from the State Police in part because of injuries he suffered in the collision with Mr. Rivera. 7. On April 18, 2007, respondent commenced a personal injury action against Mr. Rivera in Saratoga County, alleging that he suffered physical injury and “mental anguish” as a result of the collision. Respondent was represented in his civil suit by an attorney. 8. 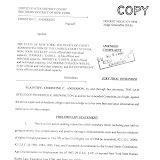 Mr. Rivera sent to respondent a Notice to Admit pursuant to CPLR 3123, dated May 21, 2007, seeking an admission that the Victim Impact Statement, a copy of which was attached, and respondent’s signature on that document were genuine. 9. 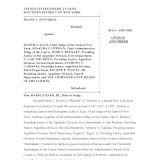 The Notice to Admit bore the caption and index number of respondent’s lawsuit and was clearly related to respondent’s personal injury action against Mr. Rivera. 10. 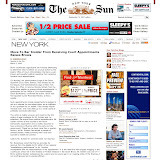 The envelope bearing Mr. Rivera’s Notice to Admit was addressed to “Hon. Carlos Calderon” and was mailed to respondent’s home address. The Notice to Admit indicated on its face that copies were being sent to respondent, respondent’s attorney and the County Clerk of Saratoga County. 12. Respondent’s attorney instructed him to disregard Mr. Rivera’s Notice to Admit. 13. After receiving Mr. Rivera’s correspondence, respondent telephoned Sing Sing Correctional Facility and spoke with Lieutenant Harry Kerrigan. Respondent told Lieutenant Kerrigan that he had received a letter at his personal residence from an inmate and that the letter was addressed to him as “Honorable Carlos Calderon.” The title “Honorable” was a reference to respondent’s judicial office. 14. Respondent asked that documents in Rivera’s possession containing respondent’s home address be confiscated and that his name be removed from Rivera’s mailing list. Lieutenant Kerrigan advised him that the request should be made in writing. 15. On or about May 27. 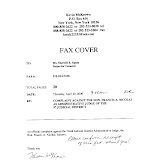 2007, respondent mailed copies of the Notice to Admit and the Victim Impact Statement that he had received from Mr. Rivera to Lieutenant Kerrigan, with a cover letter. 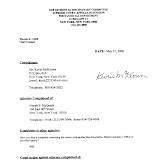 This correspondence was sent in an envelope bearing respondent’s judicial title, Milton Town Justice, and a return address associated with the Milton Town Court. 16. Respondent’s letter to Lieutenant Kenigan referred to himself as “Hon. 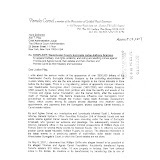 Carlos M. Calderon Ill” in the return address as well as the signature line. 18. 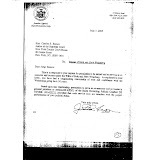 Respondent’s letter to Lieutenant Kerrigan stated that Mr. Rivera had a copy of the Victim Impact Statement in his possession, requested that documents containing respondent’s home address be confiscated and destroyed, and requested further that lieutenant Kerrigan advise “the inmate correspondence program” at Sing Sing that respondent wished no further contact with Mr. Rivera. Respondent’s letter asserted that he had spoken with Saratoga County District Attorney James Murphy as well as members of the Saratoga County Department of Probation and that all agreed that Mr. Rivera improperly possessed the Victim Impact Statement. 19. 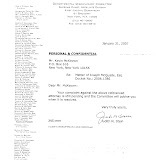 Respondents communications to Lieutenant Kerrigan lacked candor in that respondent did not refer to his pending civil suit against Mr. Rivera or to the fact that a letter he had received from the Saratoga County Department of Probation had informed him that Mr. Rivera would have access to the Victim Impact Statement if he had no attorney. 20. Respondent asserted his judicial office in his communications with prison officials in an attempt to advance his own personal interests. 21. As a result of respondent’s repeated references to his judicial office, Sing Sing officials were made aware of respondent’s judicial status. 22. Respondent’s letter, postmarked May 29, 2007, arrived at Sing Sing Correctional Facility. As a result of respondent’s request, Mr. Rivera’s legal documents, including his copy of respondent’s Victim Impact Statement, were confiscated. 23. 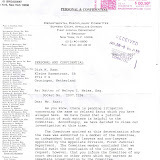 Respondent subsequently received a letter from William Lee, Deputy Superintendent of Sing Sing Correctional Facility, dated June 14, 2007, stating that various documents had been secured pursuant to respondent’s request. Deputy Lee’s letter noted the pending lawsuit against Mr. Rivera and requested that respondent submit “a response as to the appropriateness of Mr. Rivera’s possession of these documents.” Respondent did not reply to Deputy Lee’s letter. 24. 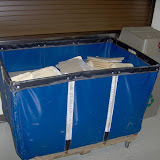 Mr. Rivera’s documents were returned to him on September 6, 2007, more than three months after respondent’s original request to have them confiscated. 25. In his testimony at the hearing, respondent failed to recognize the impropriety of his actions. In his brief to the Commission, respondent acknowledged, through his attorney, that it was improper to use his judicial title in his communications with prison officials. Upon the foregoing findings of fact, the Commission concludes as a matter of law that respondent violated Sections 100.1, 100.2(A) and 100.2(C) of the Rules Governing Judicial Conduct (“Rules”) and should be disciplined for cause, pursuant to Article 6, Section 22, subdivision a, of the New York State Constitution and Section 44, subdivision I, of the Judiciary Law. Charge I of the Formal Written Complaint is sustained, and respondent’s misconduct is established. In communications with corrections officials, respondent asserted his judicial status to advance his private interests. 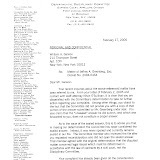 Asking the officials to confiscate documents from an inmate, which contained information that was detrimental to respondent’s interests in his personal injury lawsuit against the inmate, respondent gratuitously referred to his judicial office in an unmistakable effort to add clout to his requests. Such conduct is contrary to well-established standards prohibiting a judge from lending the prestige ofjudicial office to advance the private interests of the judge or others (Rules, §lOO.2[C]). See, e.g., Matter of Nesbitt, 2003 Annual Report 152; Matter of Cipolla. 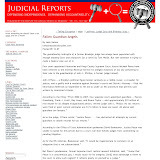 2003 Annual Report 84 (Comm on Judicial Conduct). Communicating with prison officials, initially by telephone and then in a follow-up letter, respondent advised the officials that the inmate was improperly in possession of a confidential victim impact statement containing respondent’s home address, and he asked the officials to confiscate and destroy any documents in the inmate’s possession that contained respondent’s personal information. Respondent also asked that the inmate be prohibited from contacting him in the future. In making the requests, respondent made several references to his judicial office, referring to himself as “Honorable,” sending the letter in a Town Court envelope, and, in his letter, explicitly identifying himself as a town justice. As the referee concluded, “respondent’s repeated references to his judicial status were gratuitous and can only be seen as an effort to influence the disposition of his personal requests” (Rep. 5). 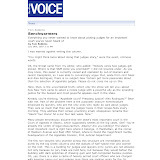 Even if respondent believed that the inmate was not authorized to possess the statement and even if respondent’s sole purpose in making the request was to protect his privacy and personal safety, as he claims, his actions showed extremely poor judgment and insensitivity to his ethical obligations. Q. Can we agree that that is the envelope that you sent your letter in? Q. Have you sent any other letters to Sing Sing Correctional Facility? Q. Judge, that envelope has your name, your title and an address associated with the court. The date on the envelope is two days after the date on your letter and you are saying that you are not sure if that’s the letter that you sent? The envelope? A. It has my name. It does not have my title. It does have my name. Q. Does that envelope not say “Milton Town Justice”? This record of evasiveness, here depicted only in part, is an aggravating factor that elevates the required sanction. Recognizing that a judge’s testimony as to his or her subjective intentions must be accorded due deference (see, Matter of Kiley, 74 NY2d 364 19891), we underscore that lack of candor in disciplinary proceedings by a judge, who administers oaths and is sworn to uphold the law and seek the truth,” cannot be condoned (Matter of Myers, 67 NY2d 550, 554 [19861; see also, Matter of Doyle, 2008 Annual Report 111 (Comm. on Judicial Conduct). As the Court on the Judiciary stated, “Devious answers in disciplinary proceedings are viewed as proffered for lack of legitimate explanation and as compounding the weight of the charge in question” (Matter of Waltemade. 37 NY2d [Ct. on the Judiciary 1975]). In its totality, the written record before us speaks clearly and warrants the sanction of censure. A judge who exercises authority over the lives and liberty of others, and who must command the respect of the public both on and off the bench, has a responsibility to be forthright and cooperative with the Commission when the judge’s behavior is questioned. We note that in his brief to the Commission, respondent now concedes the impropriety of his actions and agrees that public discipline is warranted. By reason of the foregoing, the Commission determines that the appropriate disposition is censure. Judge Klonick, Mr. Coffey, Mr. Belluck, Mr. Emery, Ms. Hubbard, Ms. Moore and Judge Ruderman concur. Mr. Emery files a concurring opinion in which Judge Ruderman joins. Mr. Harding and Judge Konviser dissent only as to the sanction and vote that respondent be admonished. Judge Peters was not present. CERTIFICATION - It is certified that the foregoing is the determination of the State Commission on Judicial Conduct. Dated: March 26, 2010. Jean M. Savanyu, Esq., Clerk of the Commission, New York State Commission on Judicial Conduct. I concur with my fellow Commissioners that Judge Calderon should be censured because his evasive, incredible responses under oath exacerbated the underlying misconduct in this case. I write to underscore what is, in my view, at the heart of this case: Judge Calderon’s misuse of the prestige of his judicial status to protect his privacy, rather than to aid his civil case against the inmate. Had the latter been proved, the appropriate sanction might be removal, even without the lack of candor described so convincingly in the determination. As the record stands, Judge Calderon misused his office in an attempt to maintain the privacy of his personal information, ie, to hide from an inmate his home address and telephone number. The judge testified, without contradiction, that that was his purpose in communicating with prison officials to request the confiscation of certain documents in the inmate’s possession. His understandable concern about protecting his family’s privacy is reflected consistently throughout this record; significantly, the only other witness who testified at the hearing, an assistant district attorney, supported the judge’s testimony on this point, noting that the judge had expressed concern in this regard during the earlier criminal matter when the inmate was prosecuted. While this does not excuse his manipulation of prison officials and the invocation of his judicial prestige to add clout to his request, it is somewhat mitigating in determining an appropriate sanction. Based on this record, it cannot be concluded that the judge’s motive was a pecuniary one, related to the pending lawsuit, rather than a legitimate concern about protecting his privacy. As the Court of Appeals indicated in Matter of Kiley, 74 NY2d 364 (1989), a judge’s testimony about his or her “particular subjective intention” should not be lightly disregarded, in the absence of “contrary objective proof’ (Id. at 371, 370). Here, the record is devoid of such persuasive, objective proof. Although the documents that were confiscated (temporarily) as a result of the judge’s request contained an admission that was detrimental to his interests in the lawsuit, the record supports that the judge may have reasonably believed, and indeed still believed at the hearing, that the inmate was not entitled to have these documents in his possession. It is debatable whether the judge recalled receiving a form letter 18 months earlier stating that the victim impact statement would be available to an unrepresented defendant, and it is not clear from the record whether the inmate was in fact entitled to keep a copy of the statement. Even the assistant district attorney testified that she did not know whether such statements were generally given to defendants. Unfortunately, the record in this case is notably sparse in other respects. Had the record been developed further, there may have been more to support the suspicion that the judge was attempting to secure an advantage in his civil suit. For example, since Lieutenant Kerrigan was not called as a witness, the substance and tenor of their telephone conversation can be viewed only through the judge’s uncontradicted testimony. 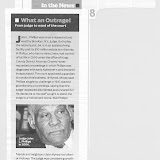 The judge’s version is all we have, including his assertion that he did not identify himself as a judge except to say that the inmate had sent him an envelope addressing him as “Honorable.” The record does not indicate when, or how, Lieutenant Kerrigan or other prison officials learned of the pending lawsuit. 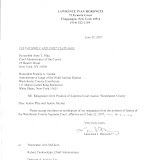 At the hearing, the judge was never asked about the basis for his statement, contained in his letter to Lieutenant Kerrigan, that the District Attorney and probation officials were unaware of how Rivera had obtained the victim impact statement and that those individuals agreed that Rivera was not properly in possession of that document. Nor were those individuals called as witnesses to contradict, or support, the judge’s written statements and give context to his request to prison officials. Without more, the judge’s testimony, though notably evasive, stands un contradicted. Under these circumstances, the majority limits its discipline to the misconduct the judge acknowledges: the assertion of his judicial prestige in a misguided, though understandable, effort to protect his privacy. Because the judge manipulated prison officials, and because he compounded his misconduct by his lack of forthrightness in these proceedings, I believe censure is the appropriate sanction. we cannot affirm the District Court’s dismissal of plaintiff’s conspiracy allegations under §1983. Plaintiff alleges a “strong appearance of bribery” surrounding $400,000 in loans given to Justice Scarpino. App. 26 (Compi. 7~ 69-70). Although Justice Scarpino enjoys the benefit of absolute judicial immunity from that claim, the other defendants involved in the alleged “bribery” scheme do not. See Dennis v. Sparks, 449 U.S. 24, 28-29 (1980). Because the District Court did not explicitly address this claim before dismissing it sua sponte, we lack a basis on which to affirm its dismissal. 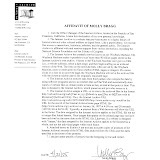 We therefore vacate the dismissal with respect to the “bribery” claim and remand for the District Court to address Ihe claim in the first instance.7 This Court must therefore apply the holding of Dennis v. Sparks8 to plaintiff’s allegations and determine whether any part of her conspiracy claim should survive. In order to survive a motion to dismiss a section 1983 conspiracy claim, a plaintiff must allege: “(I) an agreement between [two or more state actors or] a state actor and a private party; (2) to act in concert to inflict an unconstitutional injury; and (3) an overt act done in furtherance of that goal causing damages.”5 “Thus, a plaintiff must show that defendants acted in a willful manner, culminating in an agreement, understanding or meeting of the minds, that violated [his] rights, privileges or immunities secured by the Constitution or federal courts.”6 “In addition, ‘complaints containing only conclusory, vague, or general allegations that the defendants have engaged in a conspiracy to deprive the plaintiff of his constitutional rights are properly dismissed.”7 While conclusory allegations may be insufficient, “conspiracies are by their very nature secretive operations,’ and may have to be proven by circumstantial, rather than direct, evidence.”8 Finally, “[a] violated constitutional right is a natural prerequisite to a claim of conspiracy to violate such right.”9 “Without deprivation of a federal constitutional right, ‘there can be no civil rights conspiracy to deprive that right.”20 Thus, to survive a motion to dismiss, a plaintiff must allege a constitutional deprivation. 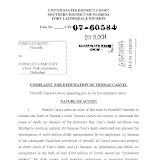 Carvel further alleges that Griffin, Markewich, Streng, McCarthy, and Aurnou “entered into covert verbal and written agreements in the Southern District, orchestrated, endorsed, or condoned by Defendants Scarpino, Scott, and Werner, to withhold ALL funds from Pamela Carvel (and the Carvel family) as fiduciary, creditor, asset owner, and benefactor.”24 Plaintiff also alleges a “strong appearance of bribery” surrounding $400,000 in “loans” given to Justice Scarpino from Hudson Valley Bank, a bank in which Griffin is the controlling shareholder. As stated by plaintiff: Streng entered the picture only when the matters in Thomas Carvel’s estate were going to trial before Surrogate Scarpino. 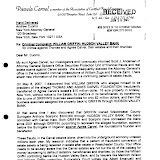 Defendant Scarpino failed to disclose conflicts with Streng and a strong appearance of bribey through about $400,000 in “loans” from Hudson Valley Bank, controlled by Griffin, who was appearing before Scarpino as witness and adverse litigant against Pamela. 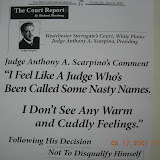 Upon plaintiff’s discovery of these transactions in 2007, this “real estate scheme” was brought before Justice Scarpino who allegedly “did nothing.”32 With further elaboration, Scarpino’s handling of this “real estate scheme” may be a sufficient overt act done with the intention of causing plaintiff to be deprived of property without due process.33 These allegations could, with further elaboration, sufficiently allege the agreement and acting in concert elements of a section 1983 conspiracy claim, at least between Griffin and Scarpino, when coupled with the above-mentioned bribery allegations concerning $400,000 in “loans” made to Scarpino by the Hudson Valley Bank. 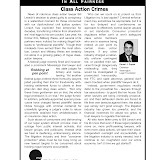 Moreover, Griffin could be deemed to be a state actor under Dennis v. Sparks given his alleged collusion with a state-court judge who, but for absolute judicial immunity, would also be a defendant in this action.34 The question, then, is whether plaintiff can allege sufficient facts so as to include Griffin and the remaining Individual Defendants in a conspiracy to violate her constitutional rights. In sum, the remaining individual Defendants could also be deemed to be state actors if there is a sufficient factual basis to conclude that they conspired with Justice Scarpino, or any other state actor, to deprive plaintiff of a constitutional right. However, the Complaint fails to adequately plead how plaintiff was deprived of her property without due process and what the Individual Defendants allegedly did, with whom, when, and what corresponding constitutional injury it caused. For the reasons given above, plaintiff’s section 1983 conspiracy claim is dismissed without prejudice. Plaintiff may amend her Complaint against the Individual Defendants within the next thirty (30) days.35 An amended Complaint must contain specific factual allegations, consistent with this Supplemental Opinion and Order, detailing the various conspiracies in which each of the Individual Defendants allegedly engaged and that resulted in a constitutional violation.36 The Clerk of the Court is hereby directed to reinstate this case to my active docket as to defendants Griffin, Markewich, Streng, McCarthy, and Aurnou. Leave to amend should be freely granted when “justice so requires.” Fed. R. Civ. P. 15(a). See also Foman v. Davis, 371 U.S. 178, 182 (1962). This rule is especially applicable to pro se litigants. See Gomez v. USAA Fed. Scm’. Bank, 171 F.3d 794, 795 (2d Cir. 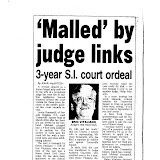 1999) @er curiam) (stating that a pro se complaint should not be dismissed without granting leave to amend when a liberal reading of such complaint “gives any indication that a valid claim might be stated”) (quotation marks and citation omitted, emphasis added). Although Gomez pre-dates the plausibility standard announced in Twoinbly and elaborated upon in Iqbal, the standard for granting leave to amend, albeit somewhat less relaxed now, must still permit pro se litigants at least one chance to “nudge their claims across the line from conceivable to plausible[. ]” Twombly, 550 U.S. at 570. I decline defendant Markewich’s suggestion to stay this case pending a decision on a motion to dismiss filed in a subsequently commenced district court action, Carvel v. Ross, 09 Civ. 722 (LAK). 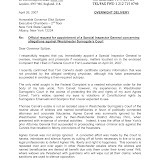 See 3/17/10 Letter from Philip Touitou, counsel to Markewich, at I. 1. Section 1983 states as follows: Every person who, under color of any statute, ordinance, regulation, custom, or usage, of any State or Territory or the District of Columbia, subjects, or causes to be subjected, any citizen of the United States or other person within the jurisdiction thereof to the deprivation of any rights, privileges, or immunities secured by the Constitution and laws, shall be liable to the party injured in an action at law, suit in equity, or other proper proceeding for redress 42 U.S.C. § 1983. 2. The Fourteenth Amendment to the United States Constitution provides, in relevant part, as follows: No State shall make or enforce any law which shall abridge the privileges or immunities of citizens of the United States; nor shall any State deprive any person of life, liberty, or property, without due process of law; nor deny to any person within its jurisdiction the equal protection of the laws. U.S. CONST., amend. XIV, § 1. 3. See Amended Complaint (“Compl.”) ¶¶ 172-203. 4. See Esposito v. State of New York, 07 Civ. 11612 (SAS); Bernstein v.Appellate Div. First Dep ‘t Departmental Disciplinary Comm., 07 Civ. 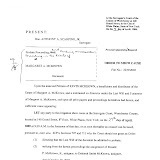 11196(SAS); McKeown v. State of New York, 08 Civ. 2391 (SAS); McCormick v. State of New York, 08 Civ. 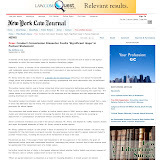 4438 (SAS); and Capogrosso v. New York State Comm’n on Judicial Conduct, 08 Civ. 5455 (SAS). 5. 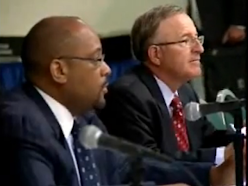 See Esposito, et at v. State of New York, Nos. 07 Civ. 11612, 08 Civ. 2391, 08 Civ. 3305, 08 Civ. 4438, 08 Civ. 5455, 08 Civ. 6368, 2008 WL 3523910 (S.D.N.Y. Aug. 8, 2008). This Opinion also dismissed Peterec-Tolino v. State of New York, 08 Civ. 6368 (SAS). Bernstein was decided in a separate Opinion and Order, also dated August 8, 2008. See Bernstein v. State of New York, 591 F. Supp. 2d 448, 470 (S.D.N.Y. 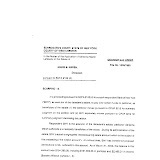 2008) (granting defendants’ motion to dismiss, dismissing remaining defendants sua sponte, and denying leave to amend). 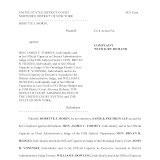 Carvel, McCormick, Capogrosso, and Petrec-Tolino were dismissed sua sponte while Esposito and McKeown were dismissed pursuant to motions to dismiss, On appeal, the Second Circuit dismissed the appeal in Bernstein and affirmed this Court in Esposito, Capogrosso, and Peterec-Tolino by Summary Order. No appeal was taken in McCormick while the appeal in McKeown is pending. 6. 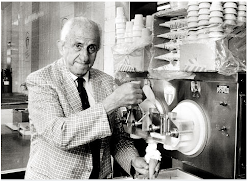 See Carvel v. New York, No. 08-4576-CV, 2010 WL 889326, at *2 (2d Cir. Mar. 12, 2010). to act “under color of’ state law for § 1983 purposes does not require that the defendant be an officer of the State. It is enough that he is a willful participant in joint action with the State or its agents. Private persons, jointly engaged with state officials in the challenged action, are acting “under color” of law for purposes of § 1983 actions. Of course, merely resorting to the courts and being on the winning side of a lawsuit does not make a party a co-conspirator or ajoint actor with the judge. But here the allegations were that an official act of the defendantjudge was the product of a corrupt conspiracy involving bribery of the judge. Under these allegations, the private parties conspiring with the judge were acting under color of state law; and it is of no consequence in this respect that the judge himself is immune from damages liability. Immunity does not change the character of the judge’s action or that of his co-conspirators. . . . 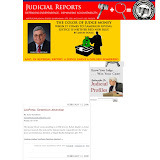 Private parties who corruptly conspire with a judge in connection with such conduct are thus acting under color of state law within the meaning of § 1983 as it has been construed in our prior cases. Id. at 27-29 (footnotes and citations omitted, emphasis added). 9. Bell At/i Corp. v. Twombly, 550 U.S. 544, 572 (2007). Accord Rescuecoin Corp. v. Google Inc., 562 F.3d 123, 127 (2d Cir. 2009). 10. Ofori-Tenkorang v. American Int’l Group, Inc., 460 F.3d 296, 298 (2d Cir. 2006). 11. In re NYSE Specialists Sec. Litig., 503 F.3d 89, 95 (2d Cir. 2007) (quotation marks omitted). 12. See Twombly, 550 U.S. at 570 (“[WJe do not require heightened fact pleading of specifics, but only enough facts to state a claim to relief that is plausible on its face.”). 13. Ashcroft v. Iqbal, 129 S. Ct. 1937, 1949 (2009) (quotation marks omitted). 14. Id. (quotation marks omitted). 15. Ciambriello v. County of Nassau, 292 F.3d 307, 324-25 (2d Cir. 2002) (citing Pangburn v. Culbertson, 200 F.3d 65, 72 (2d Cir. 1999)). 16. Bussey v. Phillips, 419 F. Supp. 2d 569, 586-87 (S.D.N.Y. 2006) (quotation marks and citations omitted, alteration in original). 17. Ciambriello, 292 F.3d at 325 (quoting Dwares v. City of N.Y., 985 F.2d 94, 100 (2d Cir. 1993) (quotation marks, citations, and alteration omitted)). 18. Pangburn, 200 F.3d at 65 (quoting Rounseville v. Zahl, 13 F.3d 625, 632 (2d Cir. 1994)). 19. Romer v. Morgenthau, 119 F. Supp. 2d 346, 363 (S.D.N.Y. 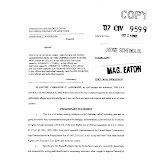 2000) (“Thus, if a plaintiff cannot sufficiently allege a violation of his rights, it follows that he cannot sustain a claim of conspiracy to violate those rights.”). 21. Plaintiff claims that Agnes’s death on August 4, 1998, was caused by a stroke “procured deliberately by stress from [defendant Williamj Griffin instigated through [the] Surrogate’s Court.” Compl. ¶ 62. 22. See id. 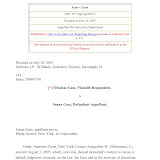 ¶ 6 (“Defendants as individual lawyers, in various positions, created or furthered systemic corruption in New York State for the purpose of furthering deceptions to steal control of the Carvel family’s. 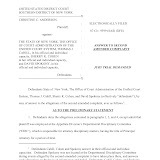 . . assets — to the total exclusion of the legitimate asset owners and their successors in interest.”); ¶ 7 (“The fundamental mechanism that makes such corruption possible is the deprivation to Pamela Carvel (and others) of all legitimate avenues of redress of grievances or judicial abuses because of intentional and negligent collusion by State employees charged with protection of Pamela Carvel (and all other citizens).”). 25. Id. . ¶ 69-70. 26. Id. . ¶ 71. 28. See id. ¶ 77. According to plaintiff Scarpino, in a written decision, “specifically denied responsibility over ethical and professional complaints against Streng and his firm.” fd. ¶ 24. Plaintiff fails to explain the significance of how and when Scarpino “denied responsibility” for Streng’s conduct and how this alleged denial violated any of her constitutional rights. 29. Id. . ¶ 77. 30. Id. . ¶ 84. 31. Id. . See id. Plaintiff does not identify to whom the mortgage from Hudson Valley Bank was made. 32. Id. ¶ 85. Once again, plaintiff fails to identify how this “real estate scheme” was presented to Justice Scarpino. 33. For example, plaintiff fails to explain the basis of her property interest in her aunt’s residence. 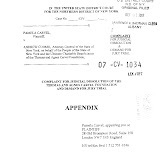 Presumably, Pamela Carvel was the beneficiary, or a beneficiary, of Agnes Carvel’s estate but this is not specifically alleged in connection with the Ardsley residence. 34. I need not decide whether plaintiff has asserted plausible claims against Justice Scarpino as the Second Circuit held that he is shielded from suit under the doctrine of absolute judicial immunity. See Carvel, 2010 WL 889326, at *1. LOCKPORT, NEW YORK—Niagara County District Attorney Michael J. Violante said Tuesday he has read the state comptroller’s audit of former County Treasurer David S. Broderick’s performance as an estate administrator and will make a public announcement at a later date on whether he will pursue criminal charges against Broderick. In a letter last year to Amherst attorney Teresa Snyder, whose complaints about Broderick’s handling of her mother’s estate led to the audit, Violante wrote that he found no criminal conduct in that case. However, the audit released Friday focused on 15 other estate cases. Broderick, 71, resigned as county treasurer in January after 37 years in office and was succeeded by Kyle R. Andrews, who was appointed by Gov. David A. Paterson to fill the vacancy. Three lawyers and two real estate brokers were busted today in a $10 million mortgage fraud scheme in Brooklyn and Queens that allegedly duped a former Lehman Brothers subsidiary and other property lenders. In the two-step scam between 2005 and 2007, lawyers Akin Ayorinde, Anthony Onua and Umana Oton are accused of using straw buyers to purchase properties in Bedford-Stuyvesant, Brooklyn and Elmont, Queens. Then they would then turnaround and sell the properties to dummy buyers at inflated prices, according to the feds. The mortgage lenders would wire the funds directly into the lawyers' accounts, according to the feds, where they would distribute it among there accomplices. Their alleged co-conspirators, Jose Vasquez and Moises Vazquez, inflated the qualifications of the mortgage applicants -- doctoring lease agreements and employment information. Another co-defendant, Hervin Henry, allegedly tricked the lenders by confirming income and employment of phantom employees who applied for the mortgages. To hide the fact that the property had flipped owners in a couple of days -- sometimes in less than 24 hours -- Marisol Vasquez and Anthony Suazo would alter dates on the titles, according to court papers. Vasquez also allegedly used her title company, Silverline Abstract, to show home improvements that had never occurred. BNC Mortgage, a subsidiary of the failed money lender, Lehman Brothers, would grant loans less than the amount of the properties after real estate agent Max Shimba and the lawyers allegedly falsely verified that a down payment had been made. A personal injury lawyer pleaded guilty yesterday to stealing more than $2.2 million in client funds and failing to file income taxes. Marc A. Bernstein, a former name partner of Bernstein & Bernstein, was accused earlier this year of failing to file tax returns from 2003 through 2007 and understating his gross income in a 2008 return. The charges of tax evasion against Mr. Bernstein, the son of former Brooklyn Supreme Court Justice Aaron D. Bernstein, came just months after he was arrested for allegedly stealing more than $1.5 million from five client. One month earlier, Mr. Bernstein, 55, spent two days in jail before his father bailed him out by using his pension as collateral. Yesterday, Mr. Bernstein pleaded guilty before Acting Supreme Court Justice Richard D. Carruthers to over 20 counts, including 16 counts of second- and third-degree grand larceny. In announcing Mr. Bernstein's guilty plea, Manhattan District Attorney Cyrus R. Vance Jr. said the case "sends a message to unscrupulous professionals who seek to prey on their clients." According to the terms of the plea, Mr. Bernstein will be sentenced to three to nine years in state prison, and will be required to pay restitution. New York State’s dysfunctional, underfinanced public defender program is a problem of constitutional dimensions. It is the subject of a class-action lawsuit, which argues credibly that indigent criminal defendants are regularly deprived of their right to effective counsel. The suit, filed by the New York Civil Liberties Union, focuses on five counties, but the problem is far broader. A commission appointed by Judith Kaye, then the chief judge, concluded in 2006 that the state’s defender system failed to provide effective representation to “a large portion of those entitled to it,” citing bloated caseloads and inadequate training and supervision. Instead of seeking a settlement that improves defender services, the state has spent the past three years trying to prevent the courts from hearing the suit. At a recent hearing before the Court of Appeals, Solicitor General Barbara Underwood argued that if the top court allowed the case to proceed, and a judge later ordered the state to spend money to upgrade the defender system, it would improperly intrude on the authority of the Legislature and the governor. The state also argues that it fulfills its constitutional duty by appointing lawyers, and court consideration of the adequacy of legal representation should be confined to individual post-conviction appeals. The Court of Appeals should reject that argument. The systemic problems cited by the plaintiffs threaten the fair functioning of the criminal justice system. The judiciary branch has both the power and the responsibility to adjudicate such claims. To block the lawsuit would set a terrible precedent for other civil rights cases where the remedy may involve more state money. Albany lawmakers must start upgrading the defender system. All current budget plans call for a permanent commission headed by the chief judge to monitor defender services and develop statewide standards. If a small increase in money were added, that would represent progress in a bleak budget year. SAN FRANCISCO—A federal grand jury in San Francisco indicted Michael Anthony Nelson yesterday on charges of mail fraud, wire fraud, computer fraud, and aggravated identity theft, United States Attorney Joseph P. Russoniello announced. The indictment charges Nelson with carrying out a fraudulent scheme in which he impersonated a licensed attorney who is also named Michael Nelson. According to the indictment, Michael Anthony Nelson, 39, of Orlando, Fla., is alleged to have created a fraudulent law firm, “Nelson & Associates,” with offices in Atlanta and Los Angeles. The defendant, who was not an attorney, gave himself the title of managing partner and hired office personnel and attorneys to work for him. The indictment alleges that the defendant impersonated a legitimate attorney with a similar name and changed the State Bar of California’s online attorney profile (maintained on computer servers in San Francisco) for that attorney, Michael S. Nelson, to match an address under defendant Nelson’s control. Defendant Nelson made false representations to obtain documents from the State Bar, including a bar card, which he then used to reinforce the impersonation. According to the indictment, defendant Nelson attracted clients by responding to Craigslist postings and registering with an online legal matching service. By representing himself as an attorney, he obtained legal fees and other funds from these clients, including at least $35,000 from Bay Area residents. The investigation began after defendant Nelson was arrested in connection with an indictment and arrest warrant from the Northern District of Illinois. The maximum statutory penalty for each count of mail or wire fraud in violation of 18 U.S.C. sections 1341 and 1343 is 20 years' imprisonment and a fine of $250,000, plus restitution. 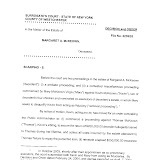 The maximum statutory penalty for computer fraud in violation of 18 U.S.C. section 1030(a)(4) is five years' imprisonment and a fine of $250,000. 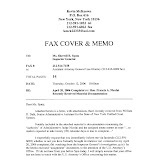 The maximum statutory penalty for aggravated identity theft in violation of 18 U.S.C. section 1028A is a mandatory minimum two years' imprisonment, to run consecutively to any other sentence imposed, and a fine of $250,000. However, any sentence following conviction would be imposed by the court after consideration of the U.S. 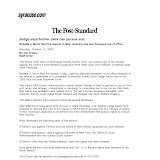 Sentencing Guidelines and the federal statute governing the imposition of a sentence, 18 U.S.C. § 3553. Michelle J. Kane is the Special Assistant U.S. Attorney who is prosecuting the case with the assistance of Lauri Gomez and Rayneisha Booth. The prosecution is the result of an investigation by the Federal Bureau of Investigation, the Atlanta Police Department, and the State Bar of California. Please note, an indictment contains only allegations against an individual and, as with all defendants, defendant Nelson must be presumed innocent unless and until proven guilty. Further Information: Case #: CR 10-0244 MHP - A copy of this press release may be found on the U.S. Attorney's Office's website at www.usdoj.gov/usao/can. Electronic court filings and further procedural and docket information are available at https://ecf.cand.uscourts.gov/cgi-bin/login.pl. 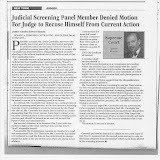 Judges' calendars with schedules for upcoming court hearings can be viewed on the court's website at www.cand.uscourts.gov. All press inquiries to the U.S. Attorney's Office should be directed to Jack Gillund at (415) 436-6599 or by e-mail at Jack.Gillund@usdoj.gov. Manhattan Surrogate Nora S. Anderson and a co-defendant, Seth Rubenstein, were acquitted yesterday in a verdict that could blow a hole in the contribution limits under the state's campaign finance law. After deliberating for about eight hours over two days, the jury found that the prosecution had failed to prove beyond a reasonable doubt that the judge and Mr. Rubenstein had lied in campaign filings about $250,000 pumped into her 2008 primary campaign for Manhattan surrogate. Surrogate Anderson sobbed with relief as the verdicts were announced. Prosecutors had contended that Mr. Rubenstein was the source of the $250,000 and that, as a candidate, Surrogate Anderson had falsely reported the funds as coming from her. The defense contended the funds were a gift and a loan and that the candidate was free to use them as she chose. The verdict frees Surrogate Anderson to assume her seat, possibly as early as Monday. She has been suspended with pay since Jan. 1, 2009. David Bookstaver, a spokesperson for the court system, said "we will assure an orderly transition in the coming days." Bronx Supreme Court Justice Troy K. Webber (See Profile) has been serving as the interim Manhattan surrogate. 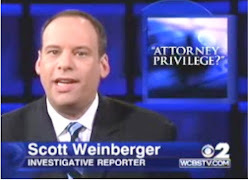 The prosecution presented undisputed facts to back up a strong case that the source of the $250,000 had been masked by Mr. Rubenstein and Surrogate Anderson: In the month before the 2008 Democratic primary, Mr. Rubenstein twice transferred funds into the candidate's personal accounts: $100,000 on Aug. 12 and $150,000 on Aug. 25. On Aug. 19, Surrogate Anderson donated $100,000 to her campaign and on Aug. 26, she loaned her campaign $170,000, $20,000 of which prosecutors acknowledge was her own. Manhattan Assistant District Attorney Daniel G. Cort argued that the money came at a critical time for the cash-strapped campaign with vendors refusing to carry out vital tasks without an up-front payment. With Mr. Rubenstein having the needed funds but unable to make them available without exceeding campaign contribution limits, and Ms. Anderson lacking the assets needed to reinvigorate her campaign, Mr. Cort contended that it would take an "Olympic leap of mental gymnastics" to find a legitimate purpose for funneling Mr. Rubenstein's funds through Ms. Anderson. The acquittal on those facts essentially eliminates the limits on the amount of money individuals may make to candidates, several election law experts said. In the 2008 Manhattan primary, the limit was $33,122. Amounts loaned to a campaign are treated as contributions if not repaid by primary day, which in 2008 was Sept. 9. 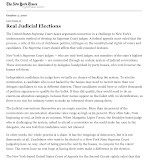 Henry T. Berger, an election law expert, said the verdict "effectively means there are no campaign limits. Anyone who wants to can evade the limits by making a gift to the candidate, as long as they pay the gift tax and don't require that the money be spent in the campaign." Another expert, Lawrence A. Mandelker, of Kantor, Davidoff, Wolfe, Mandelker, Twomey & Gallanty, said the verdict creates a hole in the disclosure law which "the Legislature will have to address." He added that the prosecution's case had been made more difficult after Acting Justice Michael G. Obus (See Profile), who presided over the trial, had dismissed eight of 10 counts in the indictment. 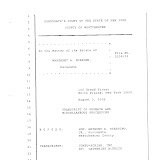 All of the counts alleging direct violations of the election law were dismissed, and only the two false filing counts were allowed to go forward because the filing took place in Manhattan while the underlying acts occurred at Surrogate Anderson's headquarters, which were located in Mr. Rubenstein's office in Brooklyn. The question of ownership was harder to prove under the filing counts, Mr. Mandelker said, than under the dismissed charges, which make any gift or loan "in connection with an election" a crime. The two defense lawyers—Gustave H. Newman for Surrogate Anderson and Frederick P. Hafetz for Mr. Rubenstein—during trial hammered away at reasonable doubt stressing inconsistencies and ambiguities in both the state Election Law and the prosecution's expert witness, William J. McCann, the lawyer at the Board of Elections in charge of enforcing the state campaign finance laws. Yesterday morning the jury asked for a read back of Mr. McCann's testimony which took close to an hour and a half. About an hour of the read-back dealt with Mr. McCann's cross-examination by Mr. Hafetz. Roughly 20 minutes after the read-back was completed, the jury informed Justice Obus that it had a verdict. 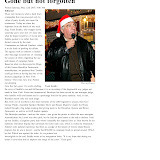 Read Mr. McCann's direct testimony and testimony on cross examination. Messrs. Newman and Hafetz during the trial cited numerous ambiguities in the election law and the way it is administered. Mr. Hafetz delivered a particularly harsh attack on Mr. McCann, calling him "pompous," the "professor of presumptions" and "a walking definition of reasonable doubt." In one instance cited by the two defense lawyers, Mr. McCann testified that the handbook prepared by the board to assist candidates in filling out disclosure forms was "wrong" when it stated that gifts from a candidate were not considered contributions. In another, they pointed out that Mr. McCann had categorized Ms. Anderson as the agent of her campaign committee. That categorization, Mr. Hafetz told the jury, was essential to "bootstrap" Mr. Rubenstein's gift to the candidate into a contribution to the committee. The problem, Mr. Hafetz related, was that there was no mention of a candidate being a committee's agent in the 2007 version of the handbook, which was the only one available to the Anderson campaign. Richard Godosky, who represented Surrogate Anderson in opposing her suspension while she fought the criminal charges, said "I assume she will take the bench on Monday and Justice Webber will return to the Bronx." Gary Spencer, a spokesman for the Court of Appeals, said Wednesday that Surrogate Anderson's suspension would dissolve by its own terms upon acquittal. 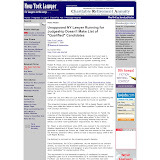 The surrogate won a three-way Democratic primary race in 2008, defeating Manhattan Justice Milton A. Tingling (See Profile) and John J. Reddy Jr., counsel to the Manhattan public administrator. She then coasted to victory without opposition in the general election. The Court of Appeals suspended her three days before she was scheduled to take office. If convicted, Surrogate Anderson, 57, and Mr. Rubenstein, 82, could have been sentenced to prison for a maximum term of 1 1/3-to-4 years. Surrogate Anderson was also represented by Richard A. Greenberg. Daniel Wise can be reached at dwise@alm.com.